Formed in 1967 [sic], The Grateful Dead championed the free-form improvisational sound that defined San Francisco rock & roll in the 60's. Jerry Garcia (guitar), Phil Lesh (bass), Bob Weir (guitar), Ron "Pigpen" McKernan (keyboards) and Bill Kreutzmann (drums) made up the original band. In 1968 they added Mickey Hart to the line-up. The band's first four albums, Grateful Dead (1967), Anthem of the Sun (1968), Aoxomoxoa (1969) and Live Dead (1970) concentrated on capturing the band's legendary live sound on vinyl. 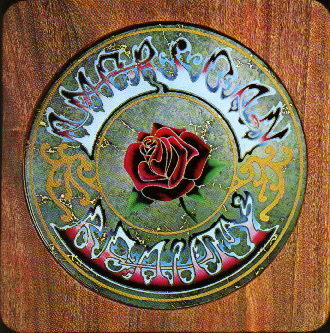 On Workingman's Dead (1970), the band returned to its American musical roots with a selection of blues, country and folk-styled originals. The trend continued with American Beauty (1971). Produced by the Grateful Dead, the album contains 10 original selections showcasing the band's songwriting skills. Three cuts, "Truckin'," "Box Of Rain," and "Ripple," received considerable FM radio play, while songs such as "Sugar Magnolia" and "Friend Of The Devil" became standards in the group's concert repertoire. American Beauty's country-blues feel was enhanced by guest performances from famed mandolin player David Grisman, guitarist Dave Nelson (of New Riders Of The Purple Sage) and others. CDD Pre-Mastering by Joe Gastwirt. Assisted by Dave Collins. American Beauty was released in November 1970.